Sundance Gallery Gifts Annual Winter Clearance Sale and Open House! 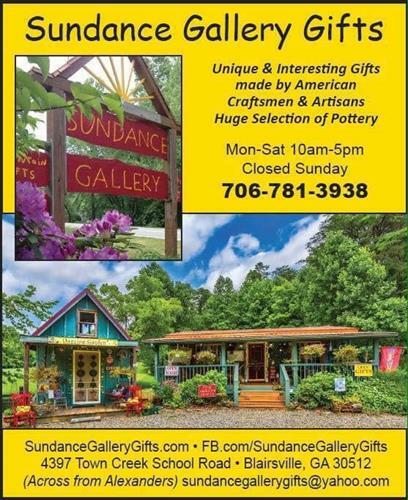 Name: Sundance Gallery Gifts Annual Winter Clearance Sale and Open House! begins on Monday, February 18th! We need to clear out slow-moving merchandise for new and exciting art and quality gift items. DISCOUNTS RANGE ANYWHERE FROM 20% OFF TO AS MUCH AS 50% OFF RETAIL PRICES!! Follow us on Facebook and Instagram to see our amazing NEW gift ideas as they arrive in the Shop. We are located in Blairsville, GA on Town Creek School Rd, just across the street from Alexander's Store. See Sales Flyer below and attached for details, dates and hours of operation. Shop is open to the public.